In this post I am going to explain you how you can create multilingual site using WPML plugin. A. Downloading and Installing plugin. Login to your WPML account and go to download section. Now select and download plugin to your computer, You will get a zip file. Login to your WordPress Dashboard and go to plugins page, click “Add New” plugin and select downloaded zip file from local computer. And click on “Install Now” button. To activate plugin go to “Plugins > Installed Plugin > WPML Multilingual CMS” and activate it. As soon as you activate your plugin you have to do some basic settings to start working. 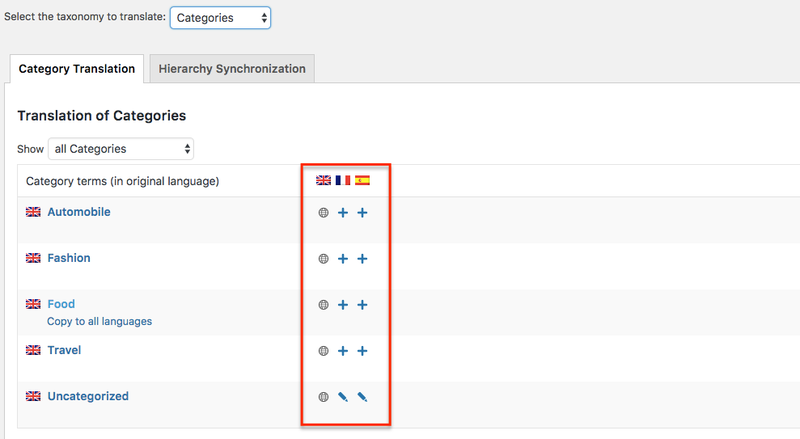 Select your default language and then select other language in which you want to translate your site. Here you can select all the languages at a time or you can select it after when needed. When all first time settings done don’t forget to register it. By registering you will get regular updates whenever a new version is released. After completing all basic settings, to translate your page/post go to “Pages > All Pages” there you will get “Plus” sign, this will indicate that those pages are not translated and ready to translate. To translate page click on plus sign under particular language (flag). It will open a separate editor, here you have to add content in that language and save all the content. 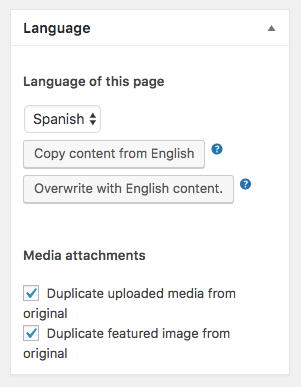 Here you will get option to duplicate “Media images and featured images” of default content. It will help to save lots of time. You will get this option in right sidebar. With same process you can translate posts. This sign indicates that page is not yet translated and ready to translate. This page is translated and you can do further editing if needed. Page is already translated but needs updation and other translation is also in progress. WPML also provides options to translate “Categories” and “Tags”. For that go to “WPML > Taxonomy Translation” in this page you will get option to select your taxonomy for translation. Suppose if we select category then you will get list of all categories. translate all your content and save it. Similarly you can translate same category to other languages. In the sme way you can translate “Tags” also. Translating “Category” and “Tags” Label. Same ‘Plus’ sign will allow you to translate it. Translating customize panel is little tricky, before that you have to download and activate “WPML String Translation” plugin. You can download it from your WPML members area. To make customize panel translatable go to “WPML > String Translation” and select “Translate texts in admin screens” available at the bottom of page. Here you have to activate option of theme, You can get it (For example : theme_mods_themename). After activating again click “String translation” here you have to select “Select strings within domain” and choose your theme name. It will show list of all translatable field. All you have to do is, choose your field and click “translation”. It will give option of all the language, just give text in particular language and save it. Similarly you can translate all the content of customize panel and save it. In this documentation we have completed almost all points to translate text. If still you have any query then feel free to contact our support forum. Our technical team is always ready to help you.